Ticket Down announces that they have slashed concert ticket prices for The Rolling Stones and Ed Sheeran concert tonight, June 27th, at the Arrowhead Stadium. 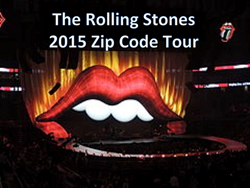 This popular ticket site has extended their customer appreciation promo/coupon code THE-STONES-2015 for added savings. The Arrowhead Stadium is also the home field of the Kansas City Chiefs from the National Football League. This stadium has the distinction of being the loudest stadium in the world. It is likely that The Stones and Ed Sheeran will "bring the house down" in KC tonight. The concert begins at 8:00 p.m. with Ed Sheeran, the opening act. Ticket Down delivers tickets to sold out concerts and events worldwide when no one else can, and they do so at discounted prices. This popular ticket exchange also has authentic tickets for The Rolling Stones in Kansas City at Arrowhead Stadium. Concertgoers can select from field seats, box seats, club seats, seating in sections 100, 200 and 300, luxury suites, parking passes and more.